With widgets you can use recommendations as interactive embedded elements or a pop-ups on any website or web document. Using widgets and not links means that users can read and navigate the recommendation without having to leave the website or platform they are in. 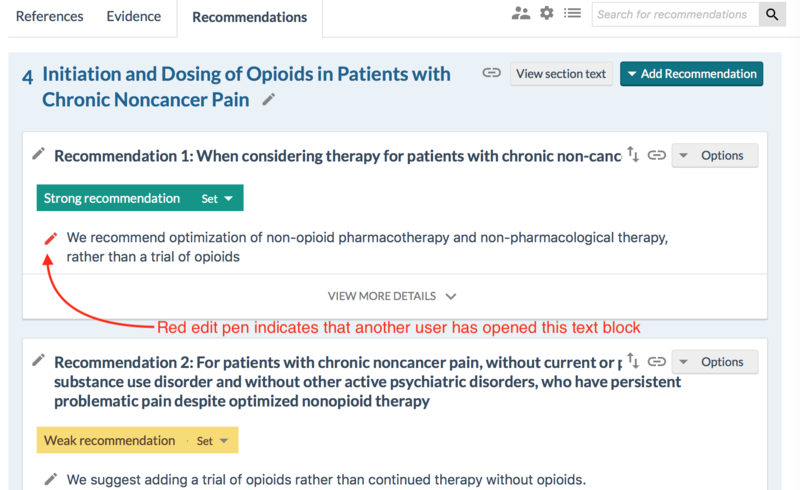 This feature is great if you would like to use your recommendations in pathway tools, decision support systems, journal articles and online textbooks. 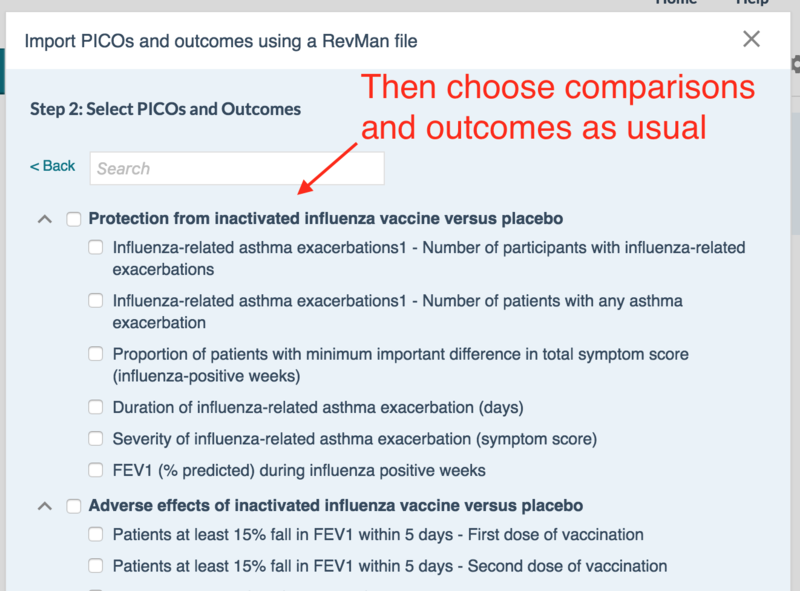 You could also use recommendation pop-up widgets if you would like to create a top level summary of your guideline and refer to recommendations in plain text. 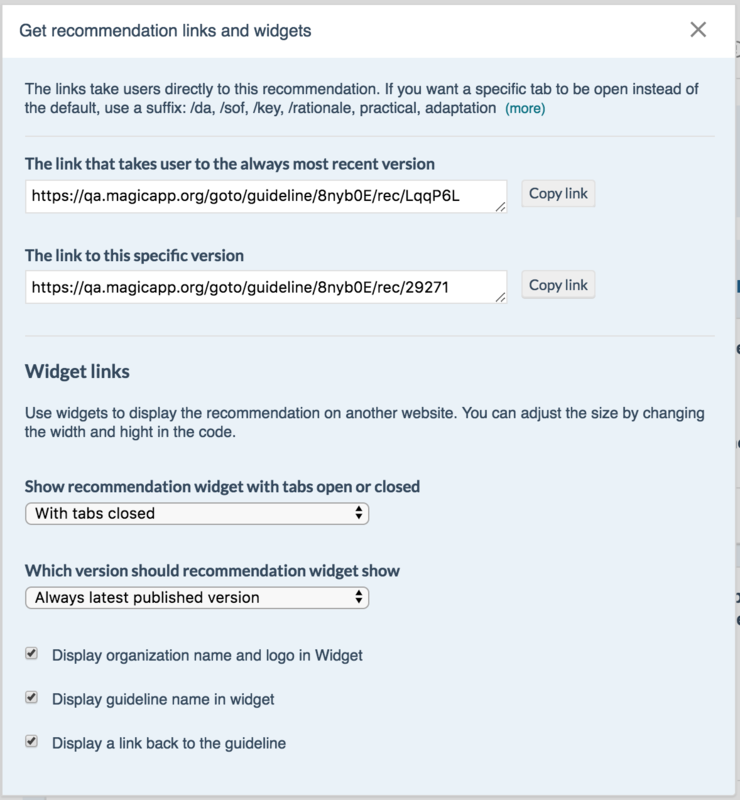 The widgets can contain the Organization logo and name, guideline name and link back to the recommendation in the online guideline. You decide what information to show. The widgets can be set to show closed, or open in the tab of your choice (e.g decision aids). You can choose to have a specific version as a widget, og the always most updated version, which means your future updates will automatically show to the user. 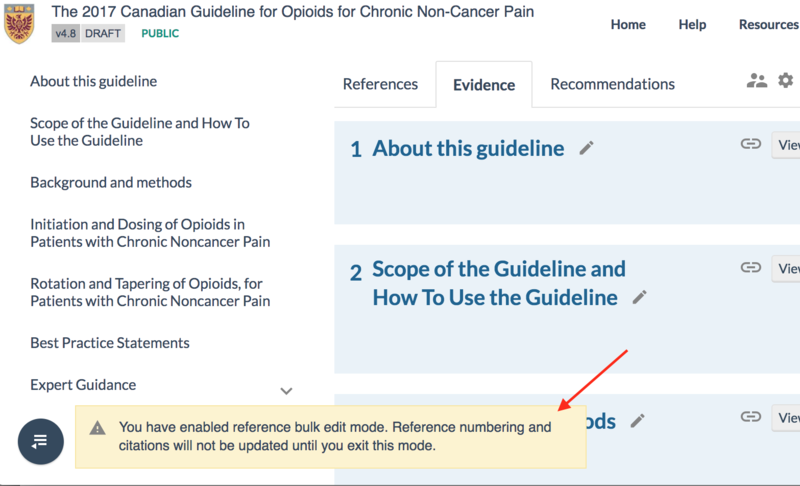 Authors can set the guideline in bulk reference edit mode to do reference moves, deletes and uploads, or section moves, without having to wait for reference renumbering. All sections, citations and references will get updated numbering upon ending bulk mode. 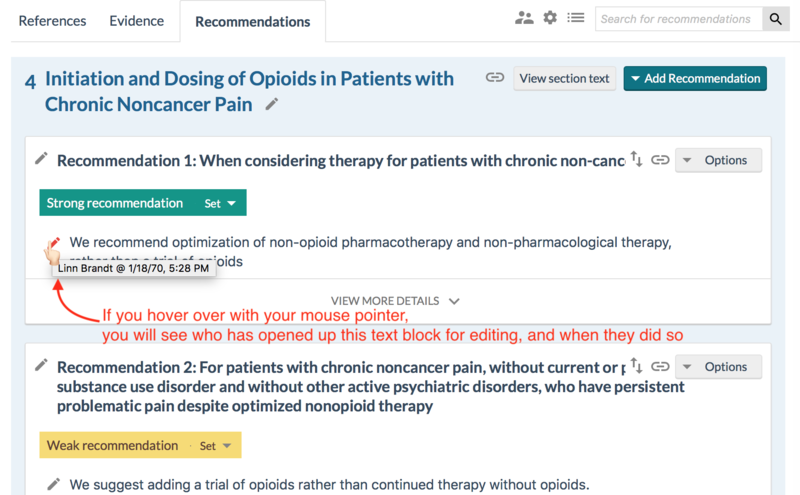 Other authors in the guideline are notified that you have initiated the bulk reference edit and will be blocked from interfering with your edits. They get a notification when you end bulk edit mode, and an option to refresh to see the new edits. 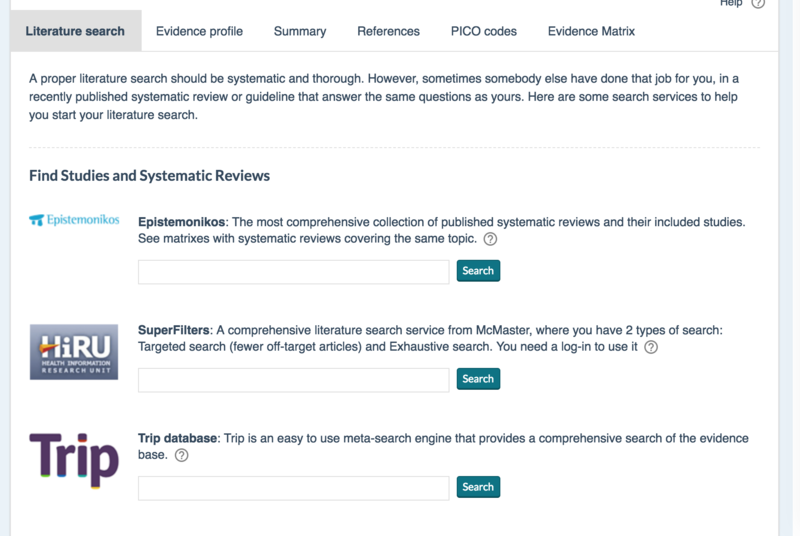 While you are in bulk edit mode, other authors can edit PICOs and Recommendations, Section text and reference details, but they cannot move or delete sections or references. If you walk away from the bulk edit mode without ending it, it will expire after 24 hours. 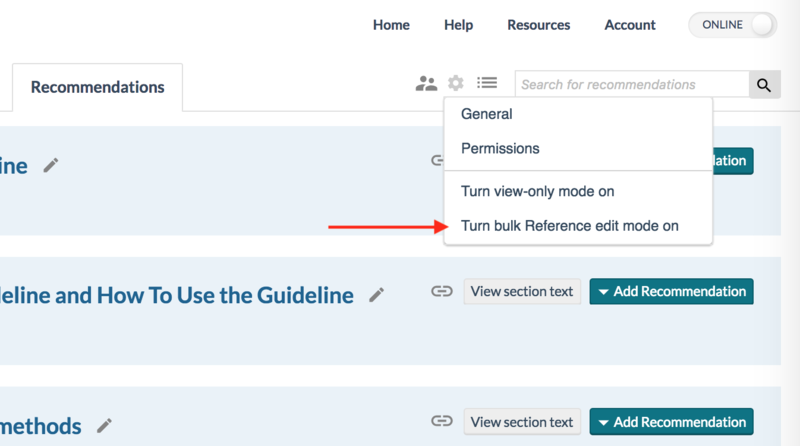 All admins in the guideline can break the bulk edit mode if needed. The changes done up until the bulk edit mode is broken, will then come into effect. The control to turn bulk edit mode on and off is in the settings menu. You always had the possibility of exporting your content as data, but now authors can now download a zip file containing a PICO with all data, connected files and references. This zip file can then be uploaded into any guideline. 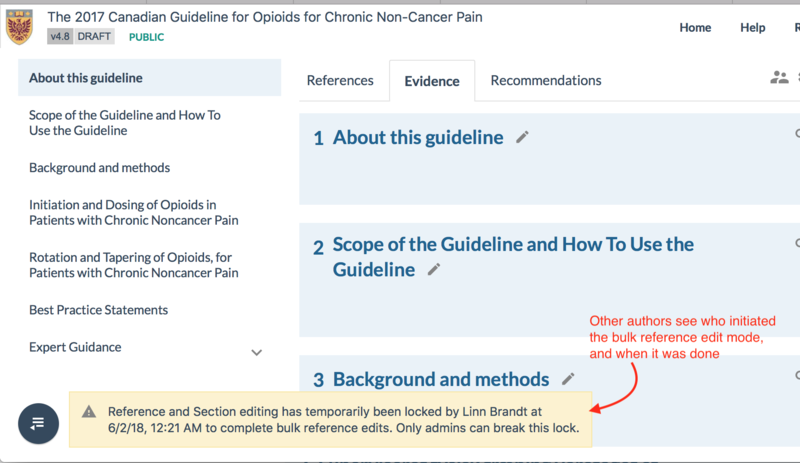 You can use these Zip files to share your evidence with other organizations, or move between your own guidelines. When you are in the draft of a guideline and other authors are working, you can see by the enteries in the activity log that they are making edits. But now you can also see directly in the interface if an author has opened up a text for editing. You will see a red pen, instead of the normal gray one, on text boxes and items that are currently being edited by other authors. If you hover over with your mouse pointer, you see which author is editing and when they started. With this feature authors can more easily be able to avoid overwrite each others edits. 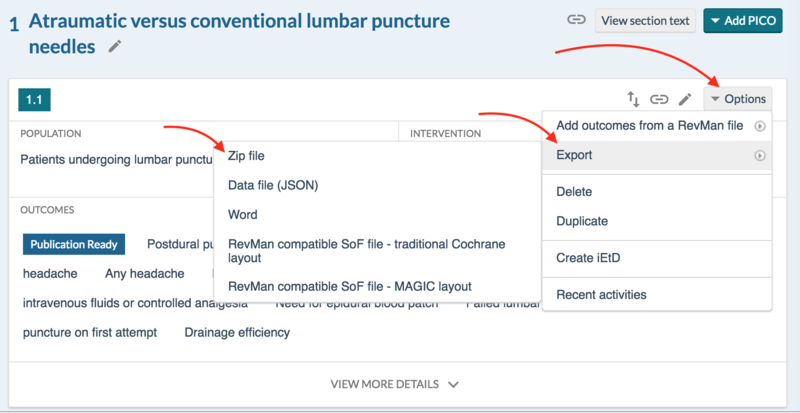 We have improved the workflow of creating PICOs and Outcomes from RevMan files, so that it is easier to reuse the files once they are uploaded. 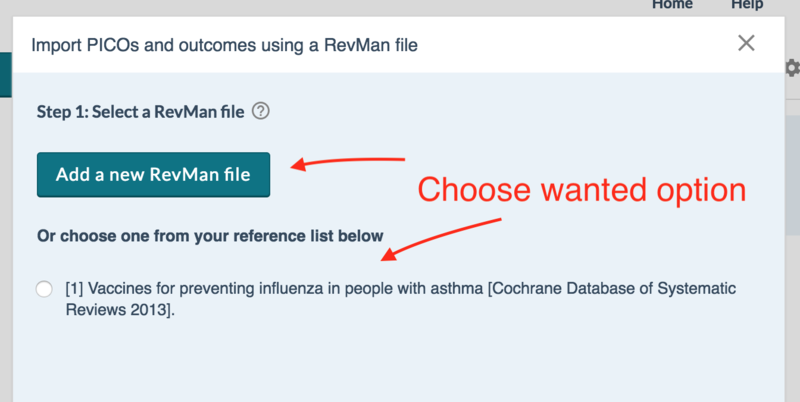 When you click the 'Add PICO using a RevMan file' - option from the Add PICO menu, you get a dialog that gives you the choice of using an existing RevMan file, or importing a new.